Every now and again I start tatting. I work on it, learn a new technique or two, then give up. Right now, I’m on a tatting binge, and am working on chains. I tatted the little piece above using this chain tutorial. I had to figure out the alligator join aspect of creating this little flourish, but I eventually worked it out. I’m still working on chains, and am using Easy Tatting by Rozella Linden as my go-to book. It’s a little difficult to understand at times, but, strangely, I’ve learned a lot from it, and am working on one of the chain projects contained in its pages. Here I am babbling about tatting, and I assume that many of you know what that is. Tatting is a way of making lace, usually with a shuttle or a needle. Here’s a good place to get started if interested or just want to learn more. There are plenty of patterns and resources online to help you get started, too. Just do a search like “beginner tatting tutorials” and you should get a plethora of places to start. Marilee Rockley, aka Yarnplayer also is a good person to get to know when it comes to tatting. Check out her website and Craftsy class on tatting. 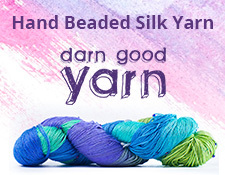 She’s also got a ton of cool free patterns on her site, too. So, perhaps I will have a few more fun tatted things to show you in the near future, depending on how long I can keep up with it. Posted on September 24, 2015 by jennabee25Posted in RamblingsTagged easy tatting, Marilee Rockley, tatting, tatting chains, working chains, yarnplayer.